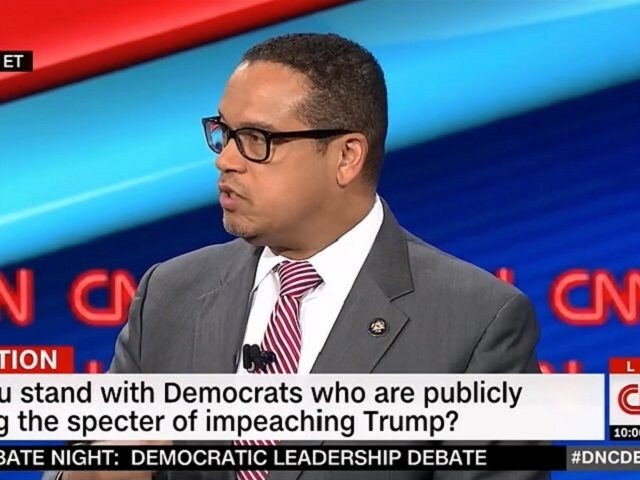 “Division” was the word of the night during Wednesday’s debate between eight candidates who are vying to become the Democratic National Committee’s (DNC) next chair. Elections are this Saturday in Atlanta Georgia, where 447 DNC members will vote to appoint their party’s next chairman. The candidates who debated were former Obama Labor Secretary Tom Perez; Rep. Keith Ellison (D-MN); South Bend, Indiana Mayor Pete Buttigieg; Chairman of the South Carolina Democratic Party Jaime Harrison; Executive Director of the Idaho Democratic Party Sally Boynton Brown; former “Rock the Vote” President Jehmu Greene; U.S. Air Force Veteran Sam Ronan; and attorney Peter Peckarsky. The debate was moderated by CNN’s Dana Bash and Chris Cuomo. While the candidates differed on how to unite their fractured party, the one topic on which they almost unanimously agreed was their opposition to President Donald Trump. Buttigieg and Ronan stood out as alternatives to the ongoing power struggle between the remnants of the Bernie Sanders and Hillary Clinton campaigns, and the progressive-versus-moderate party fault lines . Howard Dean, for one, has recognized the value of introducing young blood into the Democratic Party. “Most important thing: He’s the outside-the-Beltway candidate,” he said in a ringing endorsement of Buttigieg, hours before Wednesday’s debate, Politico reported. “This party is in trouble. Our strongest age group that votes for us is under 35. And they don’t consider themselves Democrats,” Dean said. Ellison, who has been dogged by accusations of antisemitism stemming from his past ties with the Nation of Islam and his troubling statements on Israel, criticized Trump for not condemning an alarming rise in antisemitism quickly enough. Meanwhile, the candidates presented different approaches about how to reunite the Democratic Party. Perez suggested it was time to “get back to basics” and Ronan called for introducing new blood. “We need to get money out of politics,” Ronan said. According to The Hill‘s newly-released survey of DNC members, Ellison has an edge over Perez. “But while both men claim they are close to securing commitments from the majority of the 447 voting members, neither candidate is assured victory,” The Hill noted.